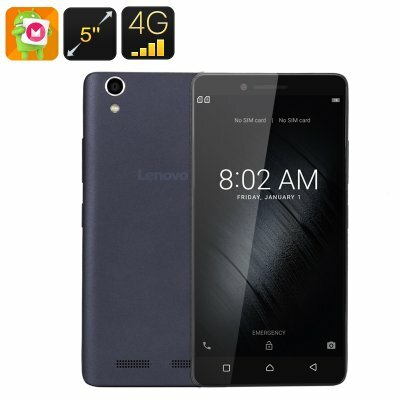 Successfully Added Lenovo K10 Android Smartphone - Android 6.0, Quad-Core CPU, 2GB RAM, 128GB External Memory Support, 5-Inch Display (Black) to your Shopping Cart. Featuring an Android 6.0 operating system, the Lenovo K10 is an affordable Chinese smartphone that comes packed with the latest features the mobile industry has to offer. Guaranteeing to deliver a smooth and powerful user experience, this Lenovo Android phone is sure to meet the demands of all type of smartphone users out there. Its powerful Quad-Core CPU along with 2GB of RAM lets you enjoy the latest and most demanding of applications, games, and media without dropping a frame. No matter what you throw at this affordable Android phone, it will take it with ease. With its beautiful 5-Inch display, this Android 6.0 phone lets you enjoy all your favorite media in stunning HD resolution. Increasing your mobile entertainment experience even further, this 5-Inch smartphone packs the Adreno 304 graphic’s unit that supports great visuals and graphics. With this Android phone at hand, you’ll be able to engage in the most demanding of mobile games, enjoy the latest movies, and take advantage of the best mobile applications out there. Simply head out to the Play Store to download the media of your liking – with 16GB of internal storage and the added possibility to insert a 128GB micro SD card, you can be assured that this smartphone will always hold enough space for you to store all your files and media alike. By supporting 4G connectivity, this Android phone provides you with the fastest data speeds currently available. Stream online movies at lightning speeds or download the latest applications and games in the blink of an eye – with the Lenovo K10, a slow internet connection will be an annoyance of the past. Additionally, this Android phone also features two SIM card slots and Dual-IMEI numbers, further increasing your overall connectivity. Letting you be reachable on two phone numbers while using merely one device makes this 5-Inch smartphone is the perfect phone on which to separate your work and private life. At the rear of this sleek smartphone, you will be able to find a sophisticated 8MP camera that allows you to shoot beautiful pictures and detailed video of all those special moments in life. Additionally, the Lenovo K10 also features a 2MP front snapper that is perfect for all selfie lovers out there. Capture breathtaking pictures or engage in online video calls no matter where you are – with the amazing cameras intergraded within this Android phone your possibilities will be endless. The Lenovo K10 comes with a 12 months warranty, brought to you by the leader in electronic devices as well as wholesale electronic gadgets..